Annie Moses had a hard childhood. When she was only five and a half years old her father Jacob died after being badly frozen in a blizzard. It was very hard for Annie’s mother to provide for her many children and Annie soon took up her father’s rifle so that she could hunt for food. Annie seemed to have a natural talent for shooting and it wasn’t long before she was able to sell the extra animals she had killed in the nearby town. There came a time however when Annie’s mother had to find another home for Annie and Annie went to live first at an infirmary and then with a cruel farmer and his wife whom she named the "Wolves." Later the teenage Annie returned to her home and once again took up the rifle to provide for her family. Purely by chance Annie met a trick shooter called Frank Butler who not only saw that Annie had great promise as a shooter but he also decided that he wanted the talented young lady to be his wife. Annie and Frank got married and began their careers as performing shooters soon after. Annie and Frank performed in circuses and in "Buffalo Bill’s Wild West" show for many years, delighting people all over the world including several royal personages and politicians. 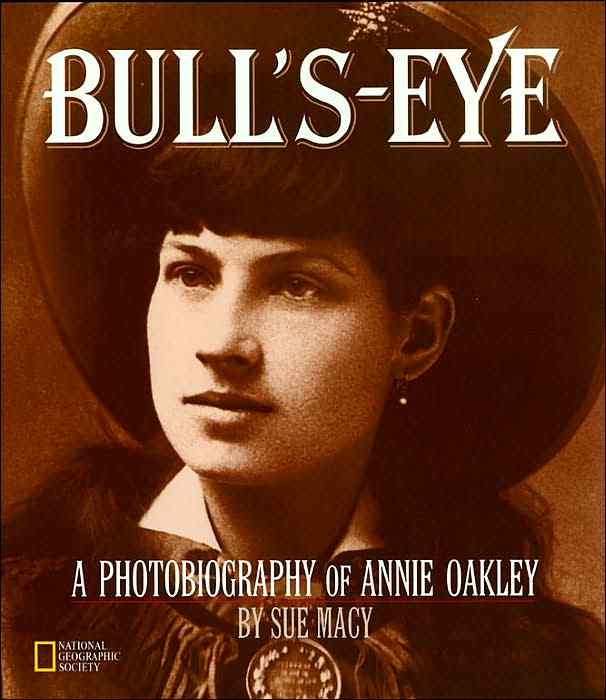 With obvious admiration and great understanding Sue Macy reveals that Annie Oakley was not some uncouth, wild, gun-toting frontiers woman. In fact Annie was gentle, loving, brave, and generous. She often shared her good fortune with others and did her best to take care of those who depended on her and whom she loved. This is the real Annie, as apposed to the myth Annie whom we have met in movies, comic books, and novels.